Finally got around to finding a trash can at Target. Now onto the design of the drive system and other essentials. Wow, been sitting on my but for awhile. Found another trashcan bot page awhile back, but as soon as I got back from competition I find he has stopped on the project. Now I must get cracking on this thing. Put together a prototype base for the motors and wheels. Seems to be just a wee bit hacked together but it should work(I hope). Also put this site together so I can show my teacher i'm not lazy. Did some testing on the power consumption and locomotion of the prototype base. I did a crude bench test and moved the base forward,reverse, and turned it both ways. It seems the motors draw about 10v together and with the extra weight, may need 12v. Also found out my tables work in Netscape 4 and IE 3, but not Netscape 3, what a joke! Decided to pick up a smaller trashcan(same color) just in case I can't finish the bigger one. This one will hopefully(if I can get my STAMPS!#@!#@)be controlled via a Basic STAMP I controller or clone. And I might go with a homebrew BS2 kit instead to save cost. Got around to ordering the kit(s) mentioned above. I chose a ready built kit and the one I'd have to put together. Also picked up a L298N Dual H-Bridge circuit to see if I can make my own. I am also gathering parts for the IRPD unit and an H-Bridge for the smaller bot. Started writing code for testing and basic functions of the robot. Might be able to get something running before school starts. Just got the stuff I ordered from Peter H. Anderson in the mail. Hoping I can test some of the crappy code I wrote the past few days. I'll be putting up pictures of the items as soon as I can(Okay, I didn't think i'd put them up so quickly, they are up now). Just got finished testing code for light tracking and using a breadboard. It works great and I'm hoping to make a PCB for it as soon as I find the instructions for the acid etch kit I had(I should really clean this place up!). I'm also gonna see if I can produce a DPDT Relay based motor controller. It may be useful when I get into robot wars type things that don't involve hacking RC cars that are weak. Found some plastic so now I have something to play with. Since i'm too lazy and haven't gather enough knowledge, i'm gonna order a Dual H-Bridge controller from HVW Technologies and a couple of encoder sets for later use. I'm also getting kinda ahead of my knowledge and thinking of getting a Motorola based board. Don't know if I could do a thing with it, but i've seen some cheap ones. When I get done putting the frame together, i'll put some pictures up of it, hopefully in a better lit area. Well, the chassis is almost done. Its rather crude to my standards, but thats what you get when you eyeball things and then don't really care about the outcome, but it will work. I'm using 5/16"(as I remember) threaded rods for the big one(which is pretty close to complete), and i'll be using 1/4" threaded rods for the little one(which is nowhere near done). I'm also gonna try and build myself a BS2 Fingerboard since i'm usually rather bored. Too bad I have no idea what i'm doing when it comes to that project. If you build it, it will run...ok, it won't run without a battery and electronics. But the chassis has been put together and put in its shell, it looks just like the 3D version too! Now I need to get the motor driver and a battery and I'll be able to run it into large objects. If you have been wanting to see it, there are pictures of what it looks like without shell and one with it on(only the lower part). I did it! I came up with code for a timer chip based IRPD unit. Oh sure its not that much, but I can't read others Stamp 2 code to save my life, okay, I can't read their IRPD code for some strange reason. You know how hard it is to program for something you can't test. Well, it looks like the IRPD software was the hardest to establish a nice setup. And now my program is almost complete except for the behavior part. I also got around to ordering the H-Bridge from HVW Technologies. I hope it gets here before school starts(doubt it). Man, if I get around to getting a Motorola based MCU, i'm gonna have a bad robot to mess with, its gonna have LOTs of stuff on it. Also added and separated the News and Information sections of this site, and the Information section has lots more stuff. Well, looks like I might try development on the TRS-4U2 Series 2(The small one), right now i'm gonna work on motor mounts and battery source. I might have to worry about room for the BASIC Stamp 2. If I can't make my own board, I might try to get the money for the BS2-IC. The good, the bad, and the broken. Well, I got my L298 Kit in the mail, hope to hook it up before Friday. On the other hand, my brackets for series 2 TRS-4U2 looked great, but then the gears didn't wanna stay onto the shaft like they use to. Been having fun at almost useless attempts at getting the wheels going in the right direction(do I need a pun for this?) with the L298 kit. It seems that my setup is causing the motors to brake and I can't get them to do what I want totally. I hope I can fix this problem soon, I wanna get sensor input on this thing! But it does move quite well on carpet and tile, but the caster needs to be smaller. Man, development on TRS-4U2 has slowed down quite a bit since school started. But none the less, I will complete this venture. Even if I have to have bump sensors, this will work! Hmm, looks like the BASIC X 24 might be a better suited CPU for the smaller TRS-4U2, not only is it cheaper than the BS2-IC, but it also has some nice features and more ram. This would allow me to use my other BS2 PIC for the larger TRS-4U2. I hope I can at least get my hands on one of those BX-24 chips. Yippe, some progress. A friend of mine decided to help me program/test the drive system of TRS-4U2. He got it to go forwards and backwards. Tommorrow he might do other stuff to it. I really need to get sensor input on it though. 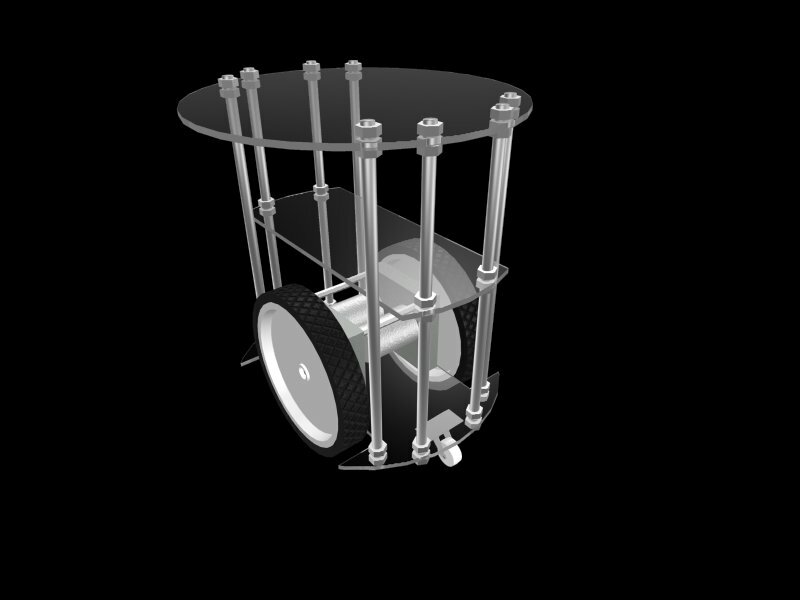 Also got an e-mail from someone commenting on my "Trash Can" robot and he is also making one to. Here is the link: The JYNX Project. Also took some newer pictures of TRS-4U2 with my teachers digital camera. Will post them soon. My friend and I worked some more on the test code. I added a spin left and spin right set to the base software. Looks interesting in motion. But as I expected, the shaft couplers work like crap. The plastic and the screws don't like each other and the screws loosen out of the wheels. I'm gonna try and get around to order an IRPD PIC Based unit from Dennis Clark. Ordered the PIC Based IRPD unit from Dennis Clark eariler this week. Uploaded those pictures as well. I'm also looking at Dennis' PWM chips as well. I might be able to get 2 extra lines from using them. All I need to do now is to get $30 from somewhere(Please mom!). Got the PIC Based IRPD unit Friday, put it together Saturday night. I might try and test it tonight but I doubt it. I'm also looking into getting those PWM chips I mentioned last week and also get a Compass from the same guy. This is gonna be an interesting project when its done. Oh my god. Things have been so...AHHHHHHHHHHHHH. The project is almost dead, but it won't die. So much has been going on in my journey through life that I really haven't had time to work on the robot, nor have I gotten the parts(wheel couplers) to really continue working on the project. But i'm doing a little better now that some of it has been straightened out. I'm hoping to get started better on my class robot that I intended to build, it needs to be done before the US FIRST competiton makes its way back. Thats about it and have a great Thanksgiving! I'm finally getting around to ordering the Serial Compass and 2 PWM chips for TRS-4U2. The PWM chips should free up 2 I/Os since they have direction pins latched as well. The compass will be used for at least two things, one of them being to find its way to a certain area, the other, to help other robots find their way to that robots current position. When I get the my class robot project going, i'm hoping that it will be the seeker robot that tries to find TRS-4U2 using compass headings. I got my Serial Compass and PWM chips today. I need to go to Radio Shack now and get the support parts. I hope I get something tested before Y2K(I had to use it). After I get these going, i'm gonna try and "test the compass"(make a program that points the robot North). This program will be quite interesting to watch if I can keep the wheels on. Happy new year and such, i've had better, but oh well. I got a PIR Sensor from Wal-Mart for about $8. Seattle Robotics has a page about Hacking a Cheap PIR Motion Sensor. I picked up the same unit and will try to get another. Along with that, I got X-mas money so i'll try and get a BotBoard I proably and upgrade the MCU for TRS-4U2. Big plans for the new year! Well, tomorrow is V-day(and yes, I mean a war for some), and its the new year also. Working out at NASA for the US FIRST competiton has been keeping us VERY busy. But I'm hoping to get cracking on my ClassBot project because I believe I have 2 Speed Controllers to work with now. My project may also get back on track because I have a source to make wheel couplers(METAL!!!). We will goto 3 competitions this year and the first one is next month(after my B-day:P, nice present huh?). I'm finally doing something! Its not on my own project, but on ClassBot. I got two Tekin Rebel ESCs from FIRST from 2 years ago and hooked them to my Homebrew Stamp 2. As of now(and I mean at this moment), I'm trying to use a hacked(completely!) joystick to control forward and reverse. This will be nice as soon as I make it look pretty. We are back from KSC and the US FIRST SouthEastern Regionals. We did great!!! And all we broke was a tie-wrap:) You can check out the webcast of the competition on NASA TV. We are also gathering parts for the ClassBot project and a possible RobotWars/BattleBots type side project. Well...I failed myself and didn't get ClassBot done, but I did help our team get ANOTHER Delphi Award at the US FIRST competition. We went to the UTC New England Regional for Spring Break and got our first Delpi Award for a Yaw/Rate sensor that helped stablize our boom. It also aided in keeping us upright because of the movement of our center of gravity as the boom extended. We went to the the National Competition the next weekend and placed 32 out of 259 teams that atteneded and got picked by the 3rd highest ranked seed. With the 3 days after the UTC competition I designed a platformt that would help demonstrate our Yaw/Rate sensor. This is proably what helped us win the award. I had a great time, meet new people, saw others grow, learned new things, and most of all, felt that I was apart of something big. Oh yeah...we were on TV too:) Not like I care about media coverage anyway....NOT! Dear lord, I updated my site!!! Well, not really, I still haven't got the wheels on TRS-4U2, and the only things touched where the links section. But, I am planning on "attempting" on building a RobotWars/BattleBots out of a large printer case made of ALL metal and was lined with a sheet of lead. Maybe I'll actually do more with both of these projects and maybe more. Until then, back to work.